FreeCAD is an open source freeware 3D CAD program. I needed some 3D models for my CubeSat battery post and it looked user friendly, so I gave it a try. I have previously used Blender3D, Solid Edge, SolidWorks, Google Sketchup and HeeksCAD. So I have some experience with 3D modelling and no experience with formula generated modelling (like many open source CAD programs tend to be). First impression - where are ALL the buttons. Then I discovered workbench switching - makes sense now. Couple of small tutorials later and I was able to model simpler things. It has usable 2D sketching tool and possibility to modify 3D models. Also almost normal assembly making ability. Like all open source tools - the GUI is still a bit rough from the edges. 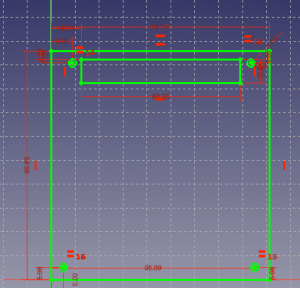 SolidWorks style constraints are a step to the right direction, but they are still a bit buggy. For example clicking on the constraints is pretty challenging. I modelled CubeSat PCB after CubeSat Kit PCB Specification and made some simple assemblies. Pictures are in the last post and here are the models.